Waste management housing from Reynolds. REYNOLDS Engineering Services has designed a new waste management housing (WMH) to address problems associated with disposal of oil cans that still contain small quantities of oil. The WMH facilitates the separation of general rubbish and the correct disposal of not-required oil, oil residue and empty oil cans in a clean and safe manner. The main collected waste uses standard 120L SULO brand wheeled garbage bins. Waste oil is collected in the integrated 70L oil tank. 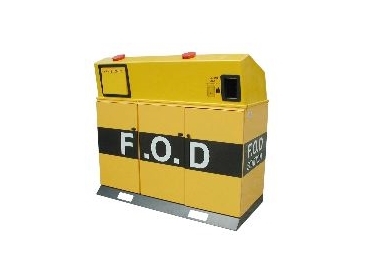 The WMH addresses OH&S and fire safety issues and includes environmental pollution controls through the incorporation of a bund tray and fully enclosed cabinet with dual purpose vent and fire extinguisher access. * Provision of oil can drainage and collection of empty steel cans for recycling. * Integrated modular design, unit can be picked up and moved by a forklift for easy relocation in case of emergency. The Reynolds WMH provides a high visibility, easy to use, easy to service and easy to clean waste management solution.